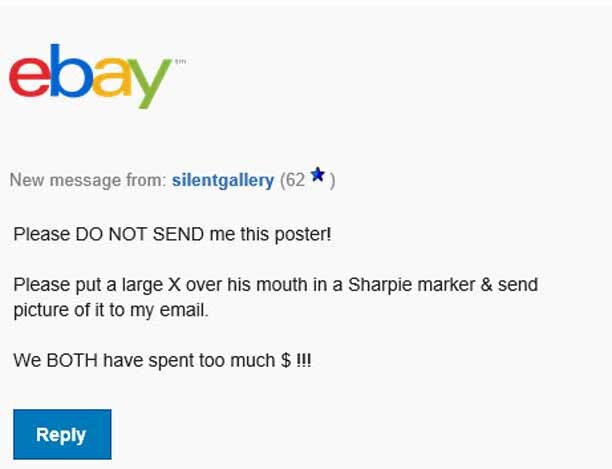 My original plan in making this offer on eBay was to follow through if anyone made a bid by mailing an empty envelope. I have rather strong feelings about Donald Trump as a person and as a U.S. president. For one thing I as the holder of a minor in Psychology awarded in 1978 sincerely believe that he suffers from at least one form of mental illness as defined by DSM-5. Consider their descriptions for Narcissistic Personality Disorder (301.81) and Histrionic Personality Disorder (301.50). You can read those descriptions and more by going here. You'll find that the DSM-5's description of Narcissism says a patient may be so diagnosed if he or she meets five of the nine criteria. I think Trump meets all nine. For another thing, to get back to my original point, Trump is utterly fearless about making promises he has no intention or ability to keep. He did this repeatedly as a candidate, which is bad enough, but he also has done it repeatedly now that he is president. 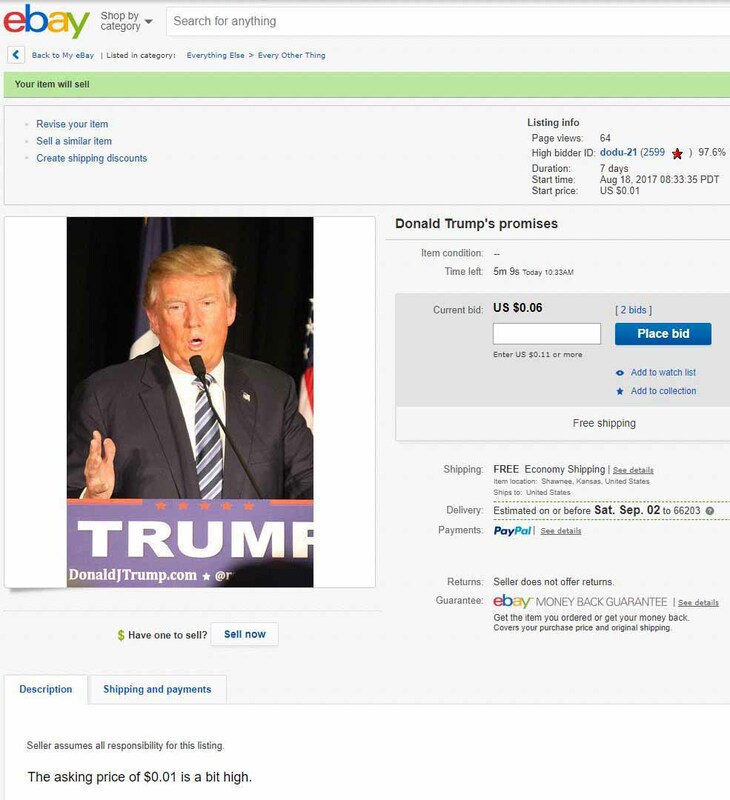 As you can see above, on August 18, 2017, I offered for sale on eBay something I titled "Donald Trump's promises." As of the screen shot above, which was five minutes before the auction ended, there had been two bids, one for my original asking price of one cent and a second for six cents. 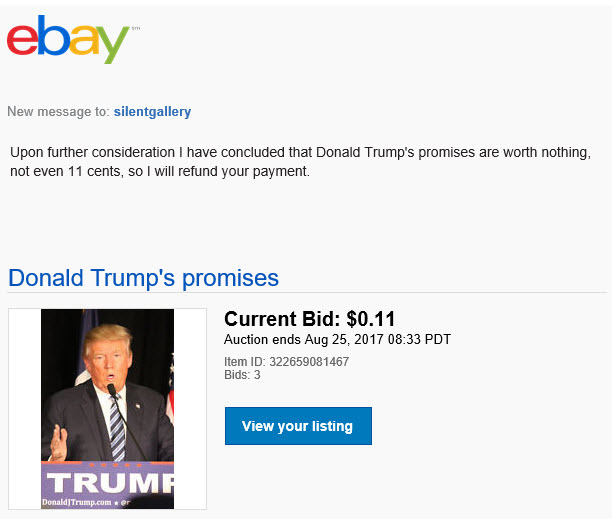 Just before the deadline I received the third bid, for eleven cents. I wrote the winner immediately. But somehow the winner got it in his or her head that I was selling a poster -- presumably of the one in the photo I randomly chose, with the "P" cut off no less -- and expressed some rather strong feelings about Donald Trump, who as of this writing is still <shudder> the president of the United States. I sincerely believe Donald Trump should be impeached and thrown out as president of the whole, entire, world-dominating, nuclear-armed United States of America. This would leave us in the hands of the ludicrously religious and right-wing Mike Pence, but he is not clinically insane. On August 26th that winning bidder sent the note below. 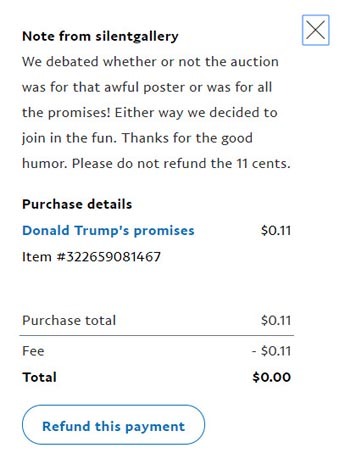 This screen shot is from the PayPal page, and you will see it's a good thing Buyer forgave the 11 cents, because that was PayPal's fee. I'm a little surprised eBay let me get away with this. Maybe they never learned about it, or maybe they did.